Mexico's coasts, deserts, and mountains alike have many reptiles found nowhere else on earth. 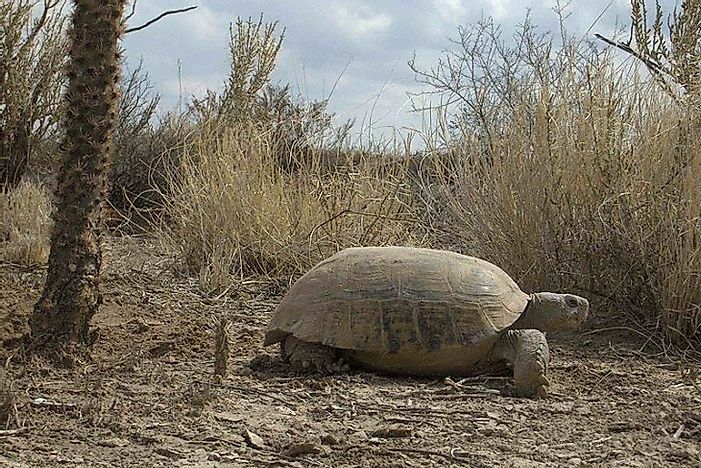 A Bolson Tortoise makes its way across the arid Chihuahuan Desert in northern Mexico. Mexico's coasts, deserts, and mountains have many reptiles found nowhere else in the world. There are 804 reptiles species known to live in Mexico, and it ranks second in the world after Australia in terms of reptile biodiversity. The reptiles of Mexico are unique in characteristics, color and behavioral patterns and most of them are rarely seen. The Mexican Horned Pit Viper (Ophryacus undulatus) is a rare and poisonous snake of the pit viper variety. The snake is native to the mountains of southern and central Mexico. The snake has a silver-gray color and it is overlaid with a network of black dorsal blotches which come together to make a broad wavy stripe. The top of the head is black in color and elongated supraocular scales forms two horns over the eyes. The adult grows to a length of between 55 and 70 centimeters. The snake is most active during the day, and it feeds on lizards and rodents. The species is ovoviviparous reptile. The species has been listed as Vulnerable because of uncontrolled deforestation. The remaining habitat range of the species is highly fragmented. The species is also killed when encountered by villagers. There are no specific conservation efforts targeted for the species, but it is present in at least three conservation areas. There are also efforts to conserve the pine-oak forests where it resides, which could ensure its sustainability. The Bolson Tortoise (Gopherus flavomarginatus) is also known as the Mexican Giant Tortoise. The tortoise inhabits several isolated basins together referred to as the Bolson de Mapimi in Mexico. The species is mostly sighted in low-grade slope characterized by desert bunch grass and mixed sclerophyll shrub. The tortoise digs burrows 2 centimeters deep as protection from severe weather conditions and predators. The species is entirely herbivorous, feeding on herbs, grasses, and shrubs. The tortoise grows to nearly 40 centimeters and reaches sexual maturity between 15 and 20 years of age. The species experienced its most severe exploitation in the 20th Century. It is listed as Vulnerable and is protected in the Mapimi Biosphere and various other private ranches. Habitat destruction and degradation are ongoing threats to its sustainability. Other native reptiles of Mexico include the Basilisk Rattlesnake, Guerrero Leaf-Toed Gecko, Monserrate Chuckwalla, Tepalcatepec Skink, Durango Mountain Meadow Snake, and Southern Occidental Bunch-Grass Lizard. The native reptiles of Mexico significantly contribute to the wildlife biodiversity and, subsequently, the tourism sector in the country. More conservation efforts are necessitated to ensure the sustainability of the unique species.